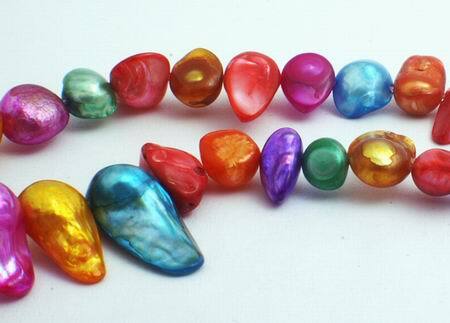 Large Rainbow Blister Pearls - Unusual! Price is per 15-inch strand of these unusual, beautiful beads. All slightly different, but average largest icicle measures about 22mm x 9mm x 7mm, and largest round is 12mm x 8mm. The least expensive cultured pearls today rival the most expensive natural pearls ever found. Natural freshwater pearls occur in mussels for the same reason saltwater pearls occur in oysters. Foreign material inside a mussel can't be expelled. To reduce irritation, the mollusk coats the intruder with the same secretion it uses for shell-building, nacre. To cultivate a pearl, farmers slit the mussel and insert small pieces of live tissue from another mussel. The ancient Chinese practiced this technique, but the first real cultured freshwater pearls originated in Japan. In the 1930's, Japanese farmers by Lake Biwa achieved natural colors unseen in saltwater pearls. However, water pollution today has virtually destroyed pearl production there. China now has the resources that Japan lacks: many large lakes, rivers, and a low-cost work force. The first Chinese cultured pearls were basic, until the 1990's when China revolutionized pearling. Shapes, luster, and colors of the new Chinese pearls now surpass Biwa quality. Copying the Japanese to improve off-white and mottling, China uses a mild bleach, bright lights, and heat. Natural freshwater pearls are usually odd shapes. So for more roundness, the Chinese now reshape rejected pearls into spheres, and then nucleate mussels with them. The best pearls have thick overlapping layers of nacre. This can be tested by viewing its "luster". Roll the pearl with a pen in good light - the best pearls will reflect the pen the most. A large pearl is only more valuable if it's the same quality as a smaller one - and the rounder the better. Being an organic gem, grooves, pits, or dents are expected. However, matching color for a complete necklace is important. Freshwater pearls are popular for their colors: white, silvery-white, pink, red, copper, brown, lavender, purple, green, blue, and yellow. The most desirable are the pastel pinks, roses, lavenders, and purples. Color comes from the mussel species and water quality. Generally pearls assume the color of the shell in which they form, but permanent dyes are used today for most saturated colors.